These Mexican Tin mirrors with hand painted Talavera Tiles will bring a warmth to any home or office. 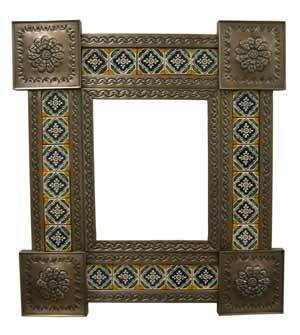 Each decorative mirror frame is made of hand tooled/hand punched tin, and each of the Talavera tiles are hand crafted and hand painted, which in turn makes them a "work of art". All Mirrors without an "add to cart" button are not currently in stock, but may be special ordered.